The internet is overflowing with ideas for extremely elaborate and creative Easter baskets- some of which aren’t even baskets at all! I’ve seen goodies stuffed into upside-down baseball caps, rain boots, umbrellas, and even baby swimming pools! And each is often filled to the brim with themed (and often pricey) goodies. While these are amazing ideas, not everyone wants to shell out a small fortune, or is able to afford such an over-the-top setup-especially if they have a large family with several children. Or maybe you’re a single parent struggling to make ends meet, one or both parents have lost their jobs, there have been unexpected medical or other bills, or you’re just generally in a tight financial spot. So an idea began brewing in my head… what if someone only had a very limited budget to work with? And if they want to not only shop inexpensively, but also get everything at a single store? 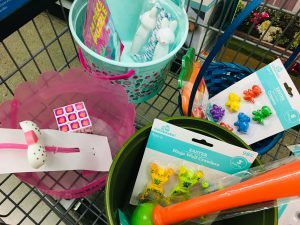 The result was… the “Walmart $25 Family Easter Basket Challenge”! I gave myself a $25 budget, and this had to cover everything for 4 (hypothetical) kids. And, of course, it all had to come from Walmart. Also, this amount had to include the baskets themselves, as well as the fluff/grass, and all of the goodies… quite a tall order! The objective was to spend relatively little money while still covering all the bases and making sure nobody felt deprived. 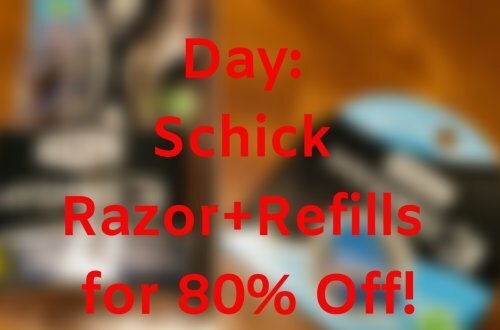 I’ll show you what items I chose, and give you a few extra helpful tips for keeping your spending to a minimum without sacrificing fun! 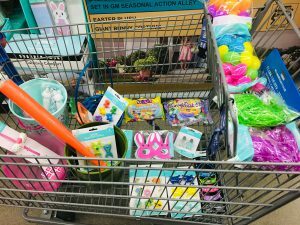 Walmart actually has a pretty impressive selection of inexpensive Easter baskets, and I wanted to get something different for every kid in our imaginary family. They carry traditional wicker baskets, as well as plastic buckets in a variety of designs. Tip: These are a great choice, because you can reuse them later as a beach or sandbox toy, or as a storage container. While there are pricier options available, as well as licensed and character-themed baskets, I think they’re unnecessary. Why spend the money on something you’re (likely) only going to use once? Kids’ tastes and preferences change every year, and you can save a ton by not falling victim to whatever the latest trends are. 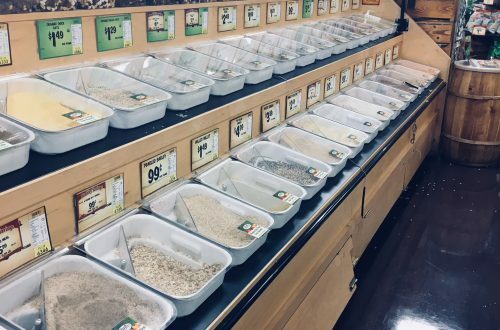 (Tip: Or even worse, those pre-stuffed baskets that are wrapped in cellophane and are set up to look snazzy and full of stuff, but are usually a ripoff… typically very little actually in them for what they cost. Don’t do it!!) Simple is the best way to go, I say! I was pleasantly surprised at the number of basket stuffers available that would work with my budget. Walmart does a great job in this department! They had everything from baseball bat sets and jump ropes, to cute eraser sets, tic tac toe games, nail polish, crayons, and more! And most of it was $3 or less per package! One thing I noticed is that most of this stuff is unavailable to purchase online, so you’ll have to see what they carry in your local store. You can go with a “theme” for each basket if you wish… for example, sports/outdoors, arts and crafts, makeup, etc. But it may be easier on the wallet if you just get whatever random items you think your kids will like. 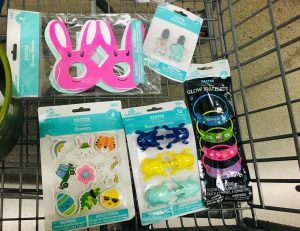 Additionally, I decided to give each child a few “bigger” items that were just for them, and also buy a few multipack/shareable items to divide up among all the baskets. Tip: looking for inexpensive items that can be shared is a fantastic way to keep costs low! Think outside the box too, not everything you buy has to specifically be from the Easter department either! While I definitely don’t think going overboard on the candy is necessary (especially if you’re on a strict budget), I wanted to include a few sugary treats for our fictitional brood. Preferably something that was chocolaty, and something that wasn’t. 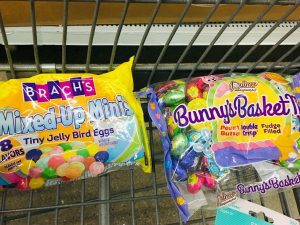 So I opted for a bag of jelly bean “bird eggs”, as well as a variety pack of chocolate goodies. That’s it… nothing crazy, but I felt like that was plenty! Tip: by focusing more on toys and other things that will hold a child’s attention for a longer period of time, you automatically get more bang for the buck…as well as the added benefit of not having to deal with a ton of candy laying around the house! But if you do buy candy, make it variety packs or something like jellybeans or M&Ms, that is easily dividable and makes it seem like the kids are making out like bandits! Ahh, the dreaded Easter grass… most people I know can’t stand the stuff, if only for the reason that you’re usually finding it in random places all over the house, long after the holiday is over. But, it’s sometimes a necessary evil, so I included a few packages of grass… but not an excessive amount. Enough for a little bit in each basket. 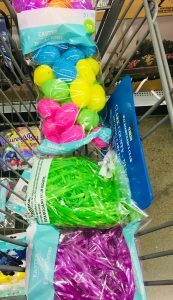 Also, I picked up this package of plastic Easter eggs, which are good for holding candy, or smaller basket stuffers. Tip: these are optional, but I think hiding a piece or two of the candy or a small toy in each egg makes it seem more special. It’s also a great way to make what you do have stretch even further! Obviously, the final amount you end up spending will vary, depending on how many people you’re buying for. You could get away with paying even less if you only have one or two kids. 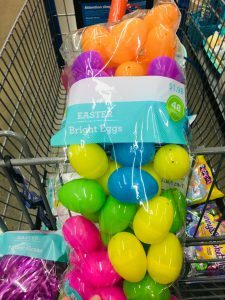 But hopefully, this guide was helpful in showing that you don’t need to have a ton of money to give your family a fun and special Easter surprise! 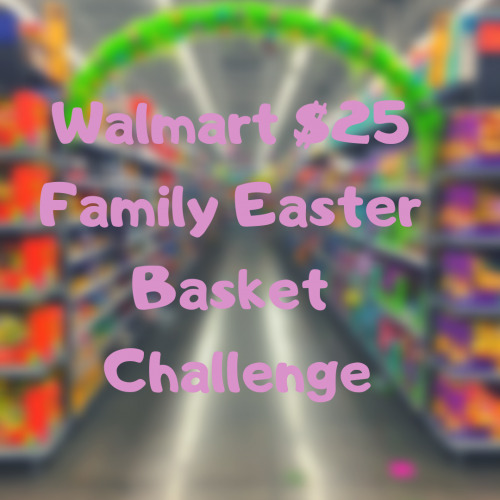 Thanks for reading all about my “Walmart $25 Family Easter Basket Challenge”! 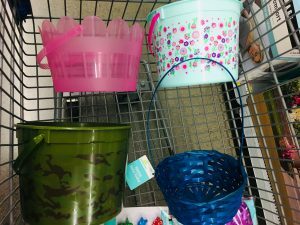 What tips and tricks do you use to do Easter baskets on a budget? Leave a comment and share your thoughts! 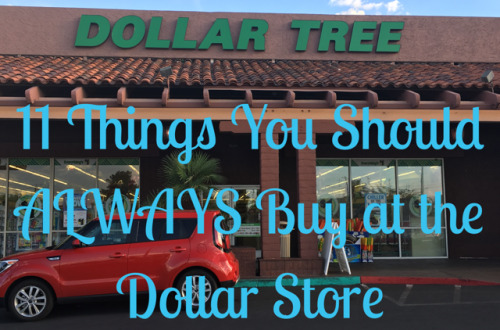 11 Things You Should Always Buy at the Dollar Store!